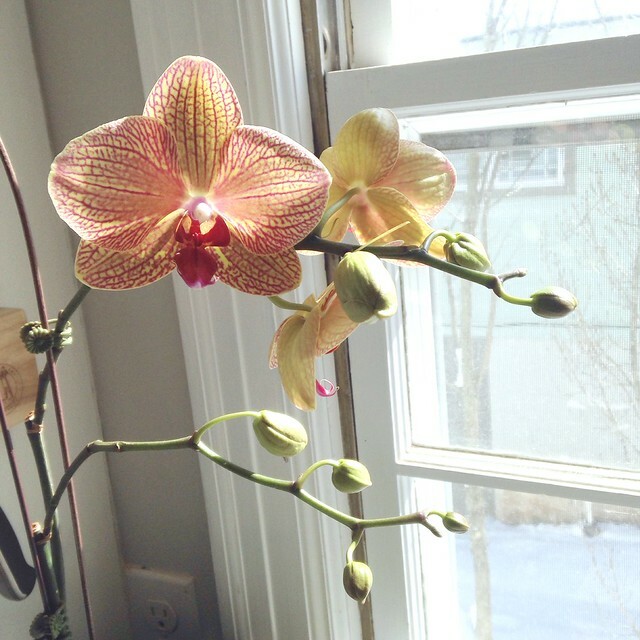 My year-old orchid, recently reblooming, recently alluded to. This morning over breakfast, I made a list in a notebook of behavioral improvements for the dogs. Eden’s list is notably longer than Pyrrha’s. But Eden has far less emotional and psychological baggage. So, we’ll see how this goes. My hair has gotten very long, and I am interested in lobbing it off. A lot of it, anyway. Curly-headed women have somewhat limited options with haircuts, which I patiently acknowledge, but I am itching for a change, along with the weather. I am reading Gogol’s Dead Souls for the first time and I am so delighted to rediscover how deeply funny he is. His pitch-perfect social sarcasm is thrilling to me. I watch the iris shoots in the front yard with bated breath, desperately hoping for resurrection. They make me feel like I should reread Louise Glück. It is a blessing to live in a town like this. And also to have found Guion when I did. Can’t anything be innate? he wanted to know, objecting to my probing into his childhood yet again. Does everything have to be an exfoliation from the minutiae of our miserable childhoods? I happen to love silence, he said. Why do we have to be swamped in narrative? Our lives are consumed in narrative. We daydream and it’s narrative. We fall asleep and dream and more narrative! Every human being we encounter has a story to tell us. So what did I think was so wrong with the pursuit of some occasional surcease of narrative? Lovely photo! Just wanted to say thanks for sharing this post. It was lovely to read. I really like your writing. And I also really enjoyed the quote so thanks for sharing that!